Kei Mouth Guest Lodge - Kei Mouth Accommodation. 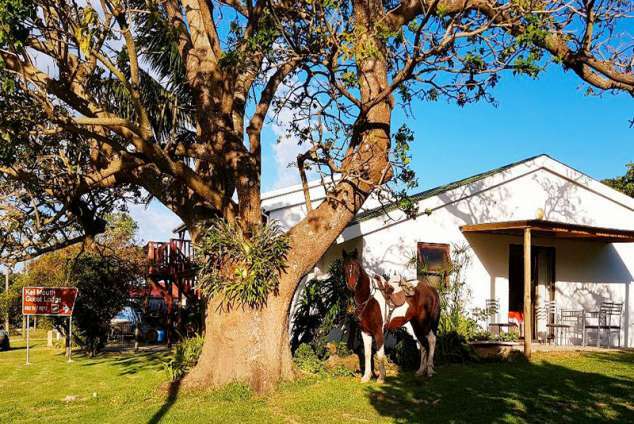 Comfortable home stay en-suite accommodation in the heart of Kei Mouth. Situated in a tranquil street just off the main road, it is central to all amenities. 18 Coral Street is within walking distance to the supermarket, pubs, restaurants, the beach, the Kei River & ferry crossing. A huge King size bed and bunk beds - en suit shower & toilet - The King bed can be split in to two singles on request, and an extra bed can be put in the room to sleep 5 comfortably - Includes light breakfast & free WiFi, tea & coffee facilities. Private double bedroom - sleeps 1 to 2 people - en suite shower & toilet - includes light breakfast - Private entrance and own patio. FREE WIFI. Tea & coffee facilities and a small fridge. Perfect for families & friends - 1 double bed, 1 single beds + 1 bunk bed - sleeps 1 to 5 people - en suite shower & toilet, includes light breakfast. Private entrance and own patio. FREE WIFI. Tea & coffee facilities and a small fridge. A light breakfast (cereal, yogurt, toast, preserves, fruit). Free tea & coffee available all day. Fully serviced daily - except Sundays. All linen including a towel. Laundry - washing machine available (pay our housekeeper R20 per load and she will hang it out to dry, and bring it in all nicely folded for you). Fully equipped self catering communal kitchen and BBQ area. Airport/Baz bus shuttle can be arranged. Dinner on request - price varies - depending on what is on the menu for that day. Home cooked wholesome meals, with main course & dessert. Casseroles/roast/ etc pre-ordered at breakfast. Walks & hikes around Kei Mouth, Morgan Bay and across the Kei. Horse Riding - for everyone. Beach - walks, chilling, swimming, fishing. Kei Mouth Country Club (golf). Day trips to Trennery's & Seagulls. Kei Mouth & Morgan Bay has a nice selection of small owner run pubs and restaurants. The food is good and each place is special in its own way. Please note that out of season, when it is quiet, the kitchens sometimes close early. Please always check during the day and we advise to book a table in advance to avoid disappointment. 424 page views since 02 Jul, 2018. Last updated on 03 Jul, 2018.